Google has released a new search mobile application, already known as Google Search, in the version for Android and iOS. Now it offers the ability to answer complex questions, claiming to have made a significant step forward compared to previous capacity to interpre users’ requests. Now the app really understands the meaning of what the user is asking (for now only in English). This type of search has evolved a lot since the days when it only allowed to search for keywords. In the past there were people searching with questions instead of keywords, with results sometimes negative. The problem was due to the fact that the search algorithm merely scanned words, without understanding the meaning of the phrase. This is changing radically but it’s a long and complex process. We take the use of language for granted but for a computer to understand the meaning of phrases is a very difficult process. 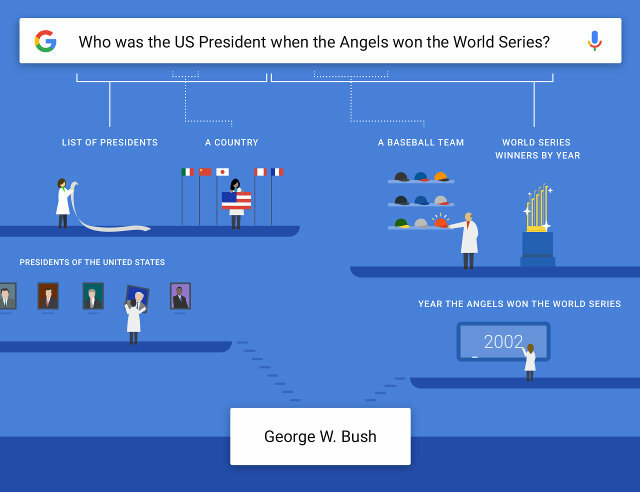 In announcing the new Google app, the author made the example of the question “Who was the U.S. President when the Angels won the World Series?”. For a human being, the problem is to have a knowledge of baseball and the past presidents of the USA good enough but the meaning of the question is easy to understand. To a search engine, the problem is opposite to that of humans. Google has access to vast databases of information so finding what it needs is very easy. Understanding the sense of the question is what took years of development. In the example in the announcement the app must understand that the Angels are the MLB team. At that point, the app connects the various information and can give the answer. Now Google app understands superlatives, questions that include the indication of a date and combinations such as the one shown in the image. It’s the result of years of development, from that of voice searches in 2008 to Knowledge Graph, the first step made in 2012 towards a semantic search where there’s in fact an understanding of the meaning of a question. The system is far from perfect but it’s learning over time. Google is developing machine learning systems such as TensorFlow, released as free / open source software last week. Slowly, it will become easier to communicate with computers using a natural language.